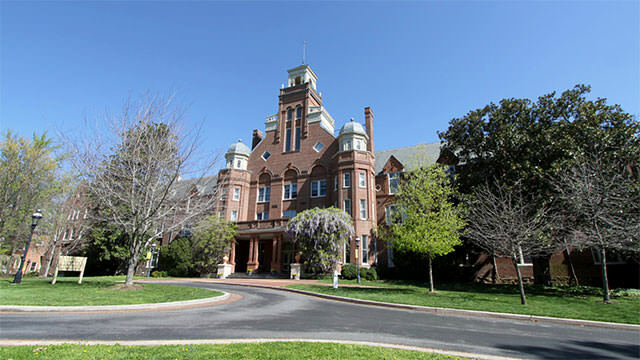 Randolph College is a Methodist, Non-Profit, Liberal Arts, College established in 1891. The campus is located in Lynchburg, Virginia, USA and hosts 576 (2011) students with an endowment of . The decision to go co-ed in 2006 created a lot of turmoil, but it is 2016 and the College is completely over that phase. Beautiful campus, extremely dedicated professors and sport coaches, comfortable dorms, plenty of good financial aid opportunities (including a LEAP program allowing local students to attend for no more than $10,000 per year BEFORE the VTAG), excellent club leadership opportunities, great network of alumnae/i, and located in a rising medium sized city with plenty of outdoor opportunities (mountains, lakes, James River, biking, etc) with a direct train ride to Washington DC two times a day! I have had a wonderful time at Randolph when I attended and the job market has been good to me after I graduated. I have also made many life-long friends from all over the world. If you’re looking at colleges please STEER CLEAR of Randolph College. What was once Randolph Macon Women’s College, a semi-respectable institution is now a shell of itself in which the admissions staff will let just about anyone with a pulse into the school. The fact of the matter is that a degree from here is absolutely useless. The only people who know what Randolph is are the loyal Lynchburg townsfolk. Thus, even when the economy turns around you’re going to have a hard time finding a job. You’d be better off getting a degree from DeVry or University of Phoenix than Randolph College. I would be surprised–shocked even, if the college is still around in 20 years. If you’re looking for a school in the Lynchburg area–I’d recommend that you don’t. There are MUCH, MUCH, MUCH better choices out there. But, if you’re set on Lynchburg, Lynchburg College would likely be your best destination. If you want a women’s college, as the above poster said, Sweet Briar is the place. And for men? Hampden-Sydney. But I can’t stress this enough, you’re best choices for liberal arts schools are not going to be in the Lynchburg area. Randolph College is a random, small, liberal arts college. It might close down in a few years due to financial difficulties. Its redeeming feature is its fabulous faculty – who stayed on from the time when it was Randolph-Macon Woman’s College, which was far better. But now… There’s nothing to really set it apart. If you’re going to go to a college, find something that stands out and draws you. There’s very little here that would do that. The campus is beautiful, yes; the admissions office seems friendly, yes; but the administration will lie and screw you over. They have no idea how to handle finances here, and they’re desperate enough for students that they’ll let almost anyone in. Yes, you can get a good education here, but… your alma mater may or may not exist in five years, and you don’t know what changes will occur in the college while you’re there. If you’re a woman, go to Sweet Briar College instead. Women’s colleges are the best! You will love it, I promise. And if you’re a guy… Go somewhere where the athletics aren’t Division III, where they have long enough beds for you, where the desks aren’t tiny, and where it’s not a college that was literally built *for* women. You won’t get what you need. I don’t recommend this school.